Cute arctic animals are surrounded by a flurry of snowflakes in this whimsical holiday Personalized Wrapping Paper. 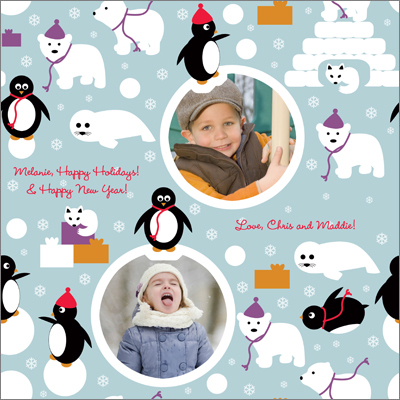 Penguins riding on snowballs frame your photos and space is provided for two custom messages. Printed in blue, purple, gold, red, white, and black, this fun colorful design will put a smile on your recipient's face!